Graduation Party - a bright future! Graduation season is here! I love the idea of throwing a graduation party. 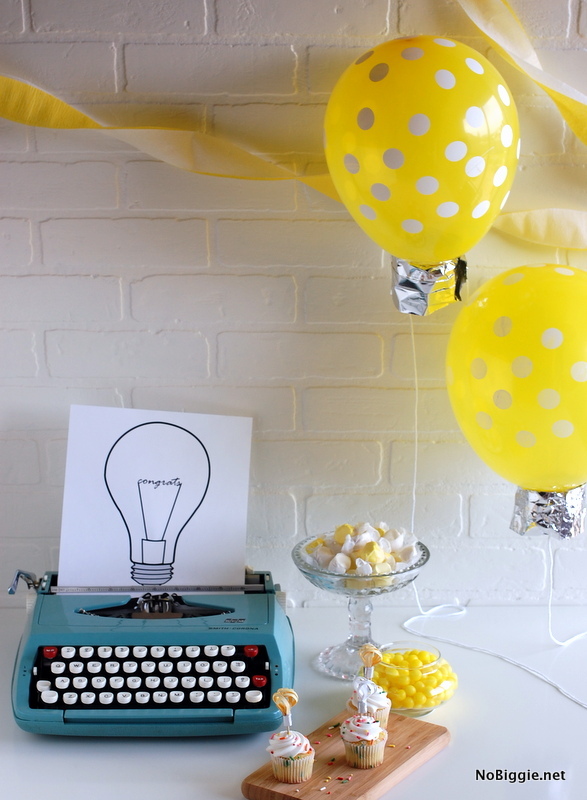 The whole idea for this party theme came from a printable idea I have had in my head with the classic shape of a lightbulb. I love the look of a classic lightbulb, and what it symbolizes. There are so many great sayings that work with a lightbulb too! For this graduation idea, it’s all about having a bright future. To start, we have little paper crafted lightbulb cupcake toppers. 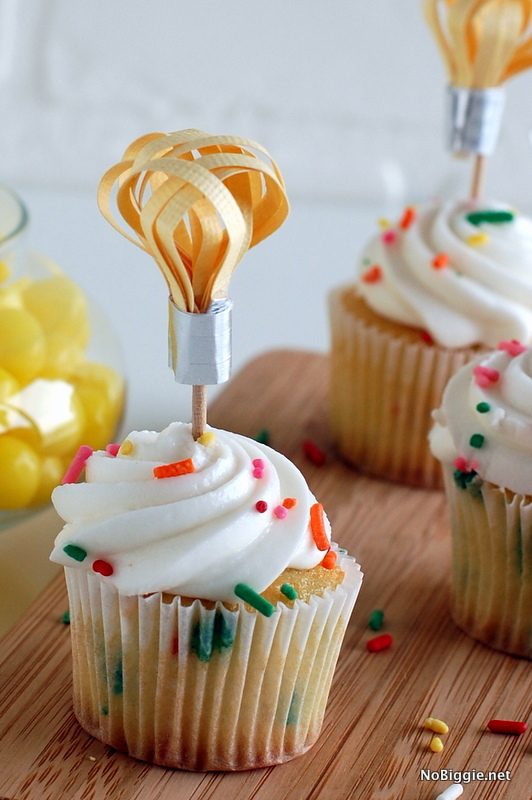 These little cupcake toppers are really easy to make. They are also really similar to the carrot and the pencil cupcake toppers, I’ve shared this year, click here for the simple how to. 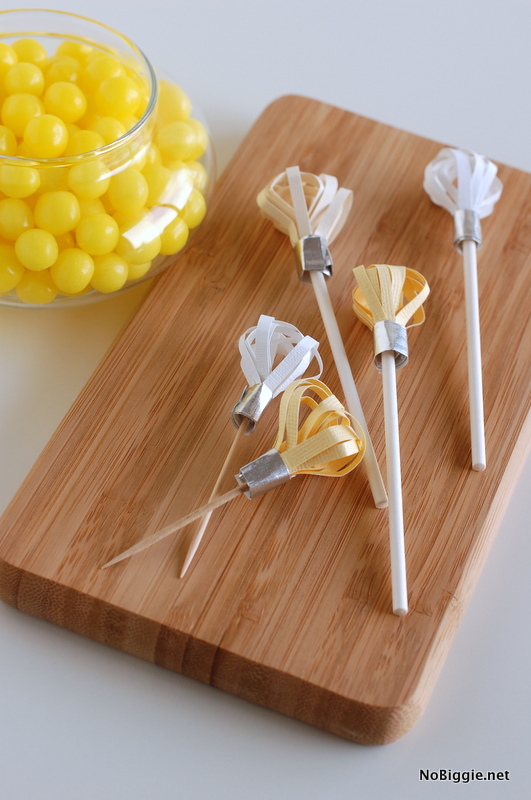 For mini cupcakes, the height of toothpicks work great; and for regular sized cupcakes, the white lollipop sticks work better. 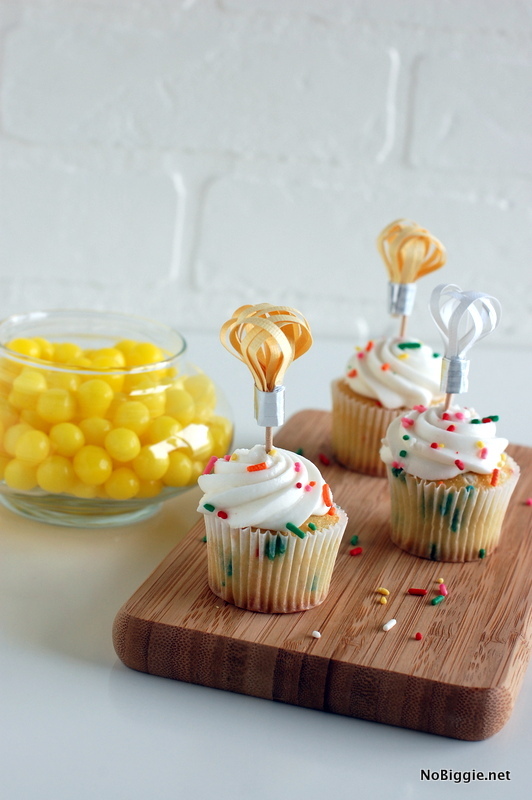 Balloons are a party must, and these lightbulb balloons are really easy to make. 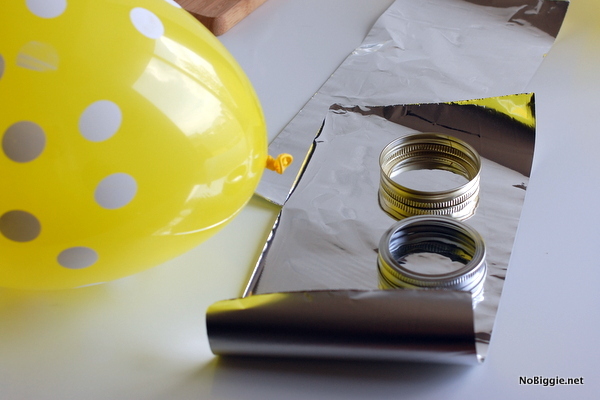 Just take a metal jar lid and a low-temp hot glue gun and glue the lid to the center bottom of the balloon. This will work in balloons that have hellium or not. Once you have the metal jar lid glued on, take a strip of tin foil and fold it back and forth to make pleats and then wrap it around the metal lid and hot glue it in a circle. 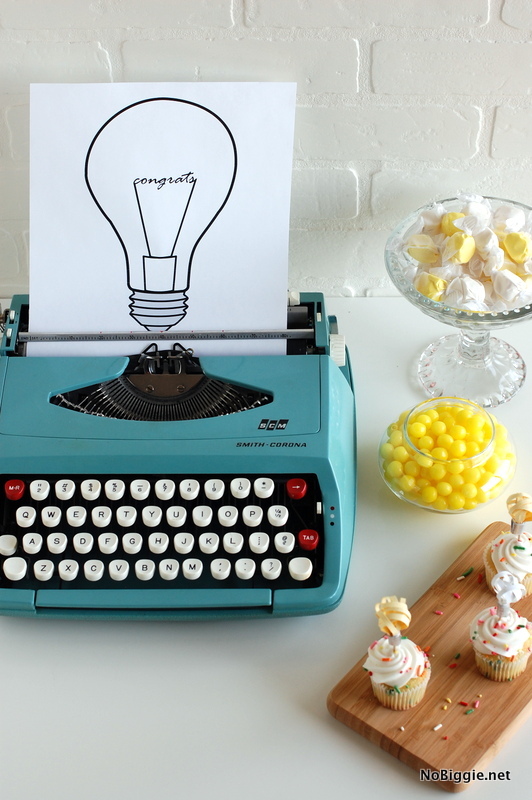 For a fun and simple decoration, we have the lightbulb printable reading “congrats” coming out of my turquoise typewriter. You could also use washi tape too, or a push pin and tack it to the wall. Come back tomorrow for this free printable along with a couple more prints that will coordinate with this party. *Just added – you can download your lightbulb graduation cards here. It doesn’t take much to throw a party. By creating one focal point for the party, you don’t have to decorate the whole house. It also makes for easy cleanup and you get a much bigger wow factor. Do you have a big graduation this year? Even a simple grade school graduation gives you a fun excuse to get together with friends and throw a party. I am OBSESSED with this. I love how simple but adorable this is. Seriously, much impressed. 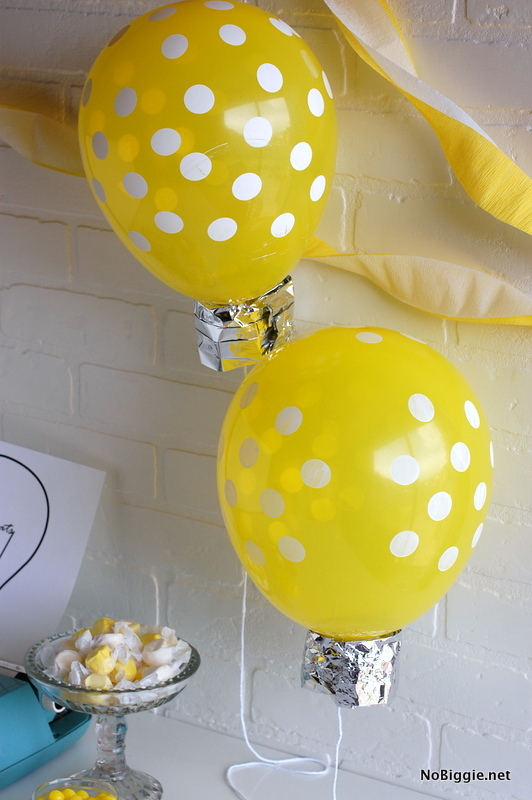 I love throwing parties, and these are some brilliant ideas! So fun! Very clever & easy too! Oh no you didn’t!… Make another cute cupcake topper that I’m going to have to copy! Love it! This really is a cute, clever and original idea for a graduate! Love the printable too. Just stop being such a genius or I’m going to have to move next to you and be your neighbor. And that might alarm you a bit. Hahahahhahaha! 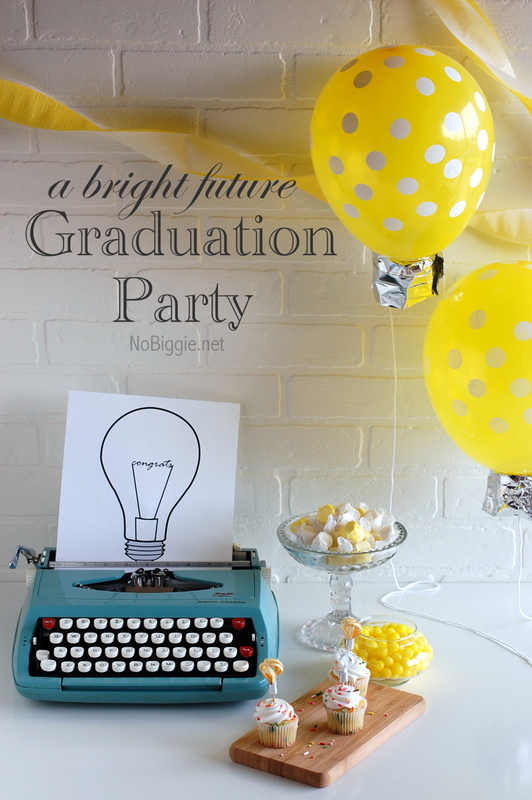 Love this graduation party theme!